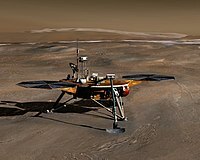 NASA has denied media and internet speculation that the Phoenix Lander has found life on the ‘Red Planet’, Mars and has also denied that the White House in the United States has been briefed on such matters that would lead up to an announcement by NASA later this week. This comes just after NASA stated on July 31, that Phoenix confirmed the presence of water-ice on Mars.Rumors began to spread on the internet Saturday after an unnamed scientist working on the Phoenix Mission stated to Aviation Week & Space Technology, the White House had been briefed on “provocative and complex” information that NASA has yet to disclose to the public regarding the “potential for life on Mars.” The scientist said that the announcement will be regarding the habitability of Mars rather than finding actual life. The scientist also said that the information had been excluded from the July 31 press conference. NASA immediately denied those claims sending out a message on Twitter, a social networking and micro-blogging website which is used by NASA to communicate to the public in a style pretending that the Lander itself is talking to its readers, stating, “Heard about the recent news reports implying I may have found Martian life. Those reports are incorrect. Reports claiming there was a White House briefing are also untrue and incorrect.” The Phoenix Lander, according to NASA, does not have the ability to detect life, past or present, but the Lander’s ‘MECA’ microscopy station can ‘see’ bacteria, which NASA states has not been discovered. The MECA or Microscopy, Electrochemistry and Conductivity Analyzer, is designed to analyze soil samples as small as 16 μm to determine the chemical composition of the sample. It is said that MECA is able to detect bacteria in the soil, but NASA states that no such discovery has been made. However, Phoenix’s MECA did detect potassium, magnesium and chloride, minerals that are necessary to create or sustain life. MECA also determined that the soil was acidic, which means it could support the growing of some plants from Earth like asparagus. Despite the denials by NASA, some Internet observers maintain that NASA is still preparing for a major announcement. “The reason that all this seems so hush-hush is due to a future paper and press release that appears likely to pop out of the American Association for the Advancement of Science (AAAS) and its Science magazine. Whatever the poop is from the scoop that’s been studied by Phoenix, that information is purportedly going through peer-review”, said David Leonard for LifeScience.com. NASA will hold a media teleconference today August 5, at 2:00 p.m. EDT, to discuss these recent science activities.